Think of all those times you have left a concert feeling so energized you don’t want it to end. You go through your music collection and just can’t find anything that feeling. Studio projects by smooth and contemporary artists tend to feel a bit subdued. Beautifully textured and elegantly produced but where’s the fire? It’s all here. 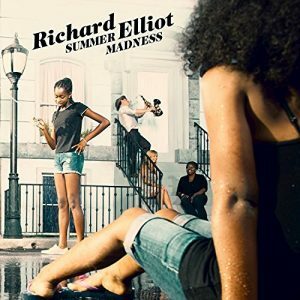 Richard Elliot’s Summer Madness is hotter than the season he evokes on the cover and in the music. My first impression was that this was his best since the early 90s before contemporary jazz smoothed out shifted to the mellow side. Now I’m thinkin’ it is his best ever. He has upgraded the things he is known for and pushed the envelope off the table and into the stratosphere. Rick Braun, his producer, co-writer, and partner in crime has done the same and all of that is amped up by the chemistry between them and the same stellar lineup of musicians that back him up on stage. Yes, it’s that good. With Braun at the helm Elliot brought in the musicians from his touring band and they went into the studio and created the original songs together organically, writing, playing, and recording as they went along. Songwriting credits on the originals are shared by all or some of the band members. The chemistry between the players jumps right out at you and gives this the live vibe. So does the energy level on the uptempo songs and deep subtleties on the softer ones. The kickoff is a cover that makes a statement. Cachaca a firey Latin flavored Spyro Gyra jam gets an update here. It’s funkier and more technologically contemporary but true to the spirit of the original with Elliot and Braun flying thru the entire range of sounds their instruments can make. Hi, low, loud, soft, fast, slow..it’s all here. Same with “Slam-O-Rama” from the instantly recognizable Randy Jacobs guitar funk infusion at the opening notes, and the appropriately titled “Ludicrous Speed.” “West Coast Jam” throws a nod to Roger Troutman and Zapp with the dirty funk groove, “c’mon and move” shoutout and some vocorder in the middle and “Mr. Nate’s Wild Ride” – a tribute to Bassist Nathaniel Phillips with a Tower Of Power reference on the side – will get your body movin’. Then there is the gorgeously elegant “Back To You” with its layered vocals and beautiful sway, this is a ballad that grabs your ears instead of fading into the background. His take on Gato Barbieri’s “Europa” is definitive. It gets added to the list of crowd melting power ballads like “When A Man Loves A Woman” and “Over The Rainbow.” The title track is magical. It’s an iconic song that captures the essence of summer. When it came out it sounded like nothing else out there and his version captures and updates that feeling for summers to come. All these songs are strong too, not a skip button jumper in the set. Big credit has to go to the whole team that participated in this recording. If you go to concerts and festivals you are undoubtedly familiar with the band, they are some of the most skilled musicians out there. Rick Braun, obviously, as a producer, writer and player. Guitarists Randy Jacobs who just shreds whether he’s soloing or holding up the background and Gerey Johnson who also shines on several songs, Bassist Nathaniel Phillips, drummers Eric Valentine and “Third” Richardson, Lenny Castro, who probably holds down percussion on half of your music collection, and Ron Reinhart – the brilliant keyboardist who sets up on one side of the stage and makes magic in every song he plays on. I have to also say that Elliot has the most gorgeous sax tone out there, even when it’s down and dirty it’s clean and clear. Yeah, you know those days when you go to a concert and at the end you want to take the band home and let them play forever. That might be hard to pull off but here’s the artist, the band, and a set of killer songs that come about as close as you can get.